It’s a special little building in the little roundabout at the seaward end of Cleveleys high street and well loved by the local community. 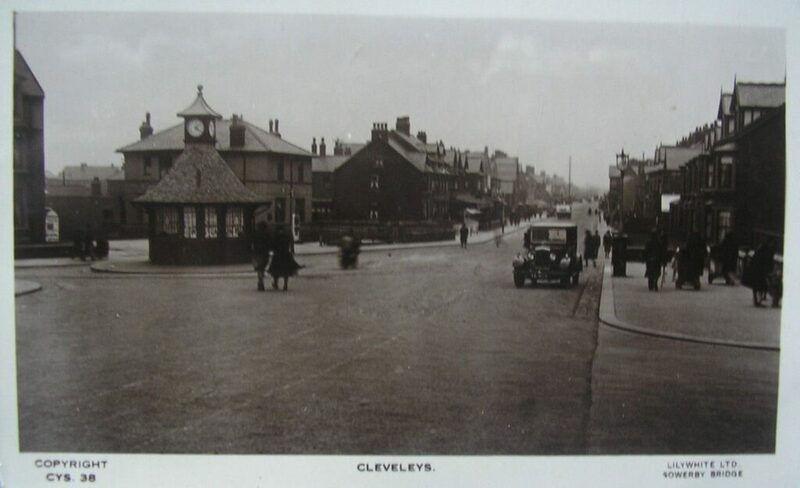 Visit Cleveleys has set out to find out more about the history of the clock shelter. What do you know about the History of the Clock Shelter? 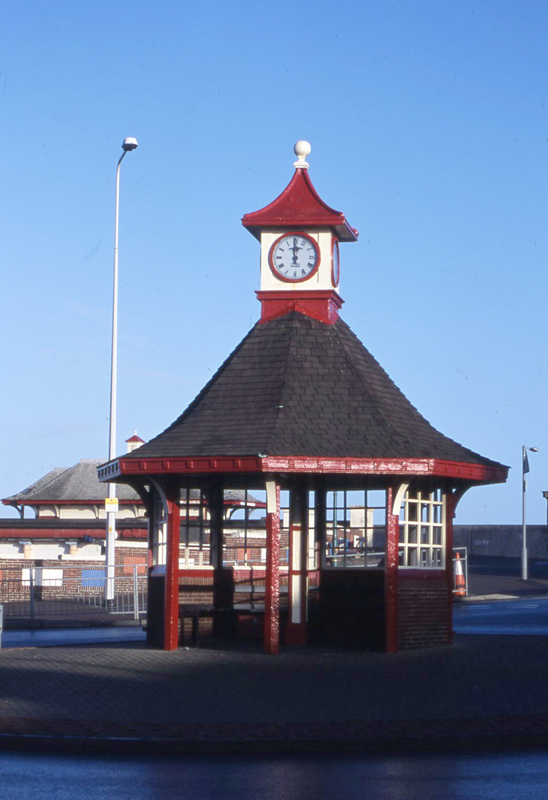 What is the history of the clock shelter? Where did it come from? When was it put in the roundabout? Have you got memories of the shelter when you were little? From day trips or maybe from climbing into the rafters? We want to hear it all, so that we don’t just preserve the shelter as it stands for tomorrow, but also collect and preserve it’s past history too. Grateful thanks go to all of the local historians and ‘Past’ Facebook Groups who have already provided information about the history of the clock shelter. 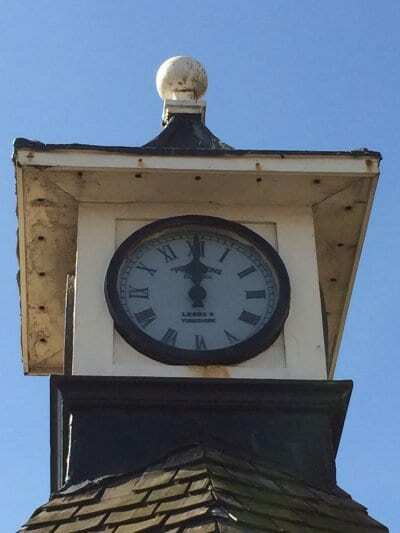 When the Clock Shelter was restored in 2014 we all tried to find out when and why it was built, and if possible to locate a photo from the time. 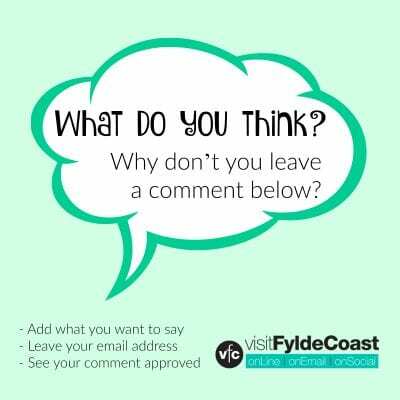 In 2014 we seemed to draw a blank, but now, thanks to local historian Nick Moore, and the good people of the Thornton Cleveleys Past Facebook group, we’ve got some amazing information to share! 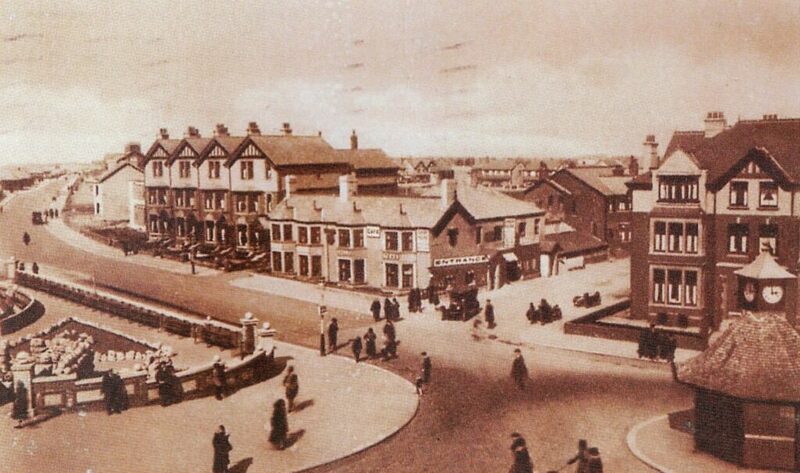 Nick tells us that the shelter and its clocks were erected on Victoria Road West, Cleveleys, in 1928. It was built to complete the New Promenade, which was opened on the 17th of September 1927. Does anyone have any other information to add? 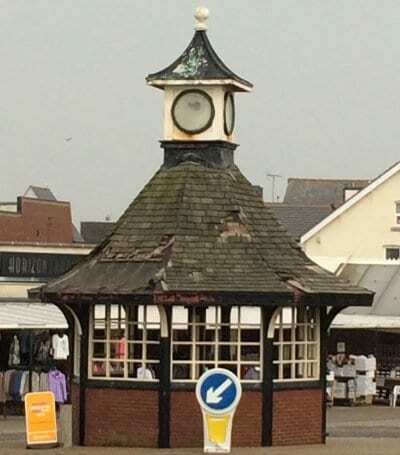 You might remember the community campaign to restore the clock shelter. That was back in 2014. 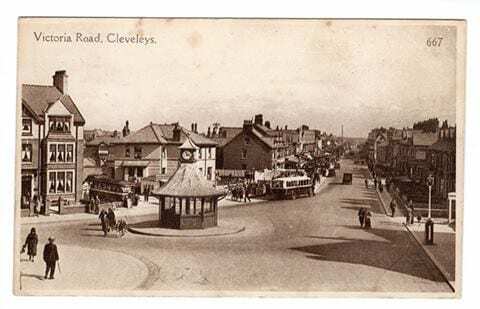 Cleveleys clock shelter features in a postcard dated 1931 and postmarked 1932.  Printed by Lilywhite Ltd of Sowerby Bridge. The photo below dates from 1937 and was also provided by Andy Ball. In it you can see that there was originally a gutter on the building, supported with fancy finials. Here’s another undated, but excellent photo, also supplied by Andy Ball. Judging by the clothes and the vehicle, it’s probably dating to the late 30’s or early 40’s. 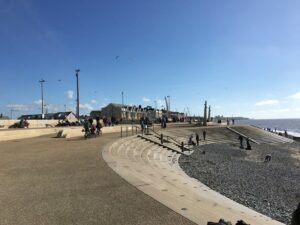 However, this is just what the promenade looked like up to the point when the new sea defences were built. 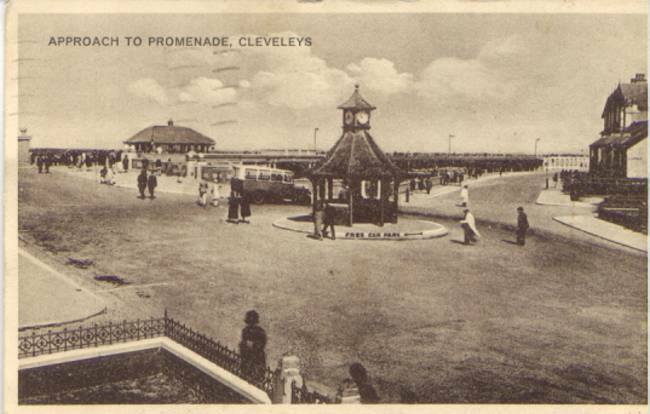 You could say that Cleveleys seafront as we know it started to grow from the 1950’s onwards. 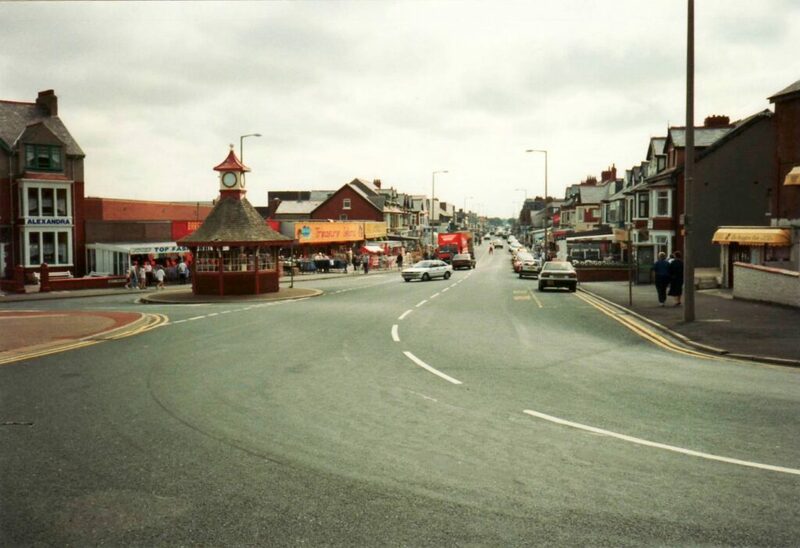 The guest houses in this photo supplied by Dave Hutchinson were later demolished to make way for the ice cream parlour and mobility shop. There doesn’t seem to be a standard name through the years for the clock shelter. Pete John Smith told us that it was known as the birdcage back in his youth, and it was also called the four faced liar. That particular nickname was because the four clocks often told a different time! This photo, sent in by Pete Skinner, was taken during a rainy weekend in 1975. Note that the clocks look to be complete, there’s still glass in the windows and it’s still got its drainpipes. Tony Bowker has been in touch with this anecdote. “I have lived in NZ for over 50 years, but remember the clock tower from my earlier days. My grandfather, Havelock Bowker, lived in York Avenue and had the job of keeping the clocks serviceable. “In the late 1940,s I used to feel very important walking up Victoria Road carrying the ladder that my Grandfather used to get up into the clock tower loft. He used to go regularly to wind the clocks and make sure that they were OK. Thank you Tony, for another piece of the jigsaw of the history of the clock shelter. This photo below, sent to us by Peter Ford, dates back to the 1980’s. The guest houses are still standing (pre the ice cream parlour and mobility shop) but the clocks have gone AWOL. If anyone knows what year the buildings were demolished, it gets us closer to dating the disappearance of the clocks. 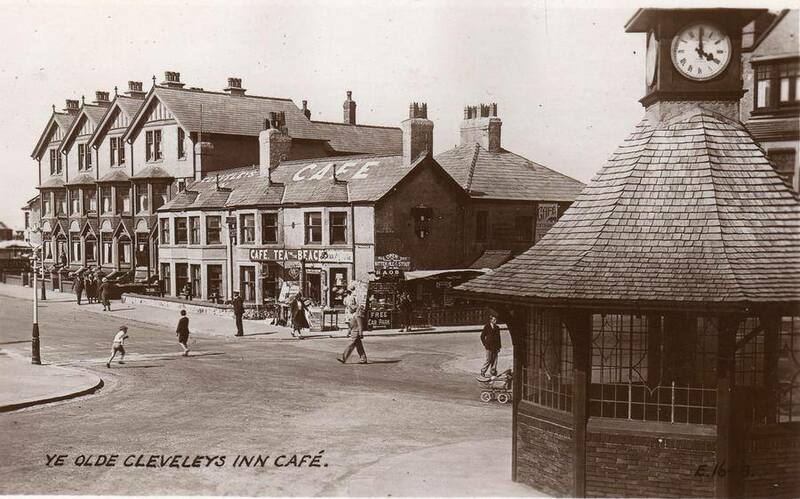 The next one below is one of our photos from the Visit Cleveleys archive, taken before the new sea defences were built. Unfortunately it’s not quite at the right angle to see whether the clocks are missing, but it’s painted in the same colour scheme as the photo above. This was scanned from a transparency. 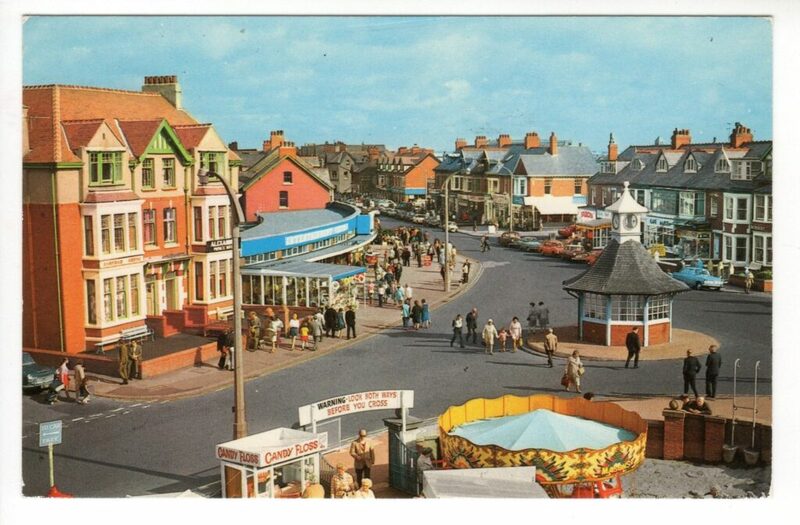 Is it the wrong way round, or have we forgotten what the promenade looked like at the left? 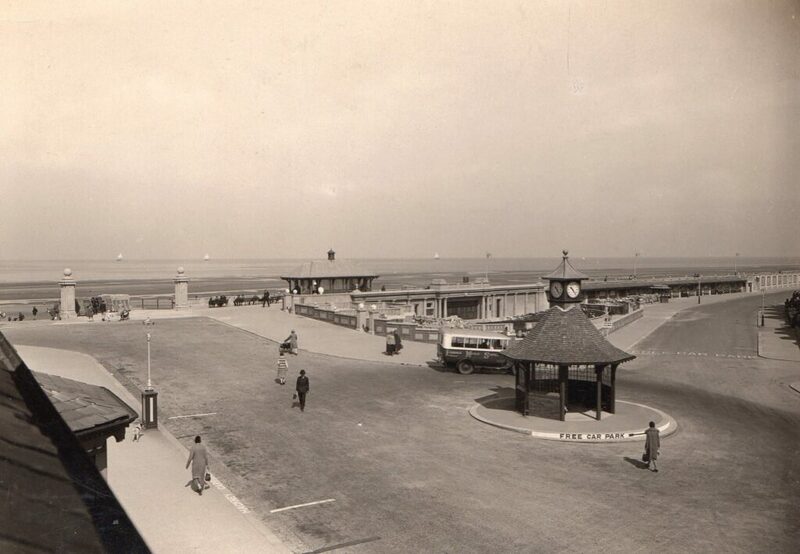 It’s interesting to look back at the history of the clock shelter and the promenade and see how things have changed. 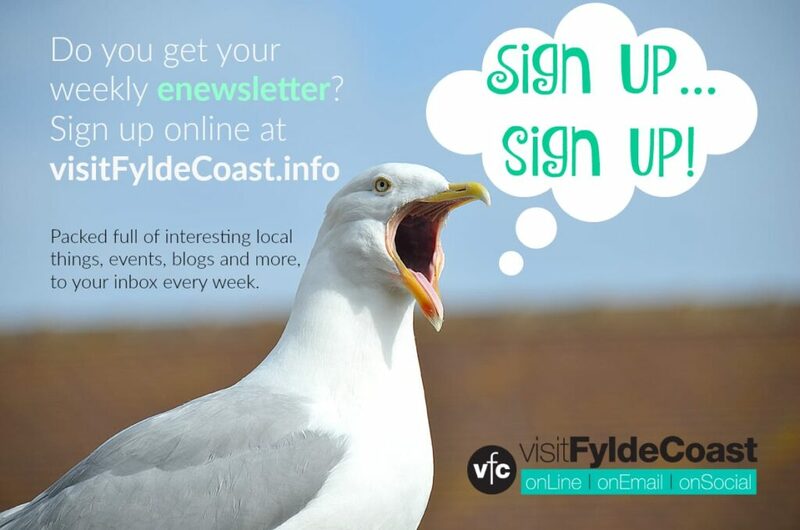 These photos are also from the Visit Cleveleys archive, and were taken in July 2008. When it was next repainted the colour scheme was changed to black and cream. It seems that our one shabby clock in the town centre roundabout on Victoria Road West might be a little treasure after all. Apparently started by William Potts who was born in 1809, the company which made our clock grew and expanded and was awarded a Royal Warrant by Queen Victoria in 1897. It was renamed William Potts & Son when three of Williams sons joined the business, but after the First World War two sons left to start their own businesses. William Potts and Sons joined the Smith of Derby Group in 1935, but kept the name. More than 1600 clocks are believed to still be in existence, and there are various notable examples including Edge Hill railway station in Liverpool. So there you go, there’s more to the history of the clock shelter than we thought. 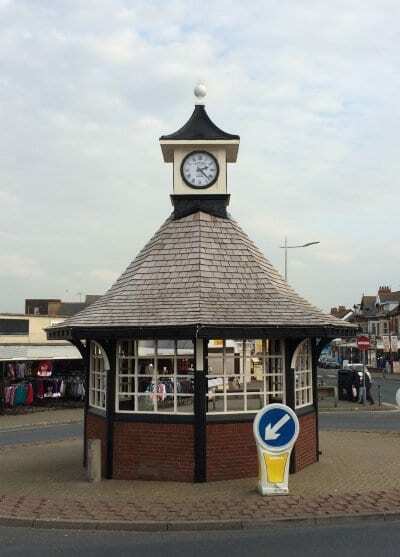 In 2014 Visit Cleveleys led the Save our Clock Shelter Campaign. Between us all we secured the future of one of the last remaining heritage assets in the town. And this is what it looked like afterwards… It’s another chapter in the history of the clock shelter, what chapters will be written next? 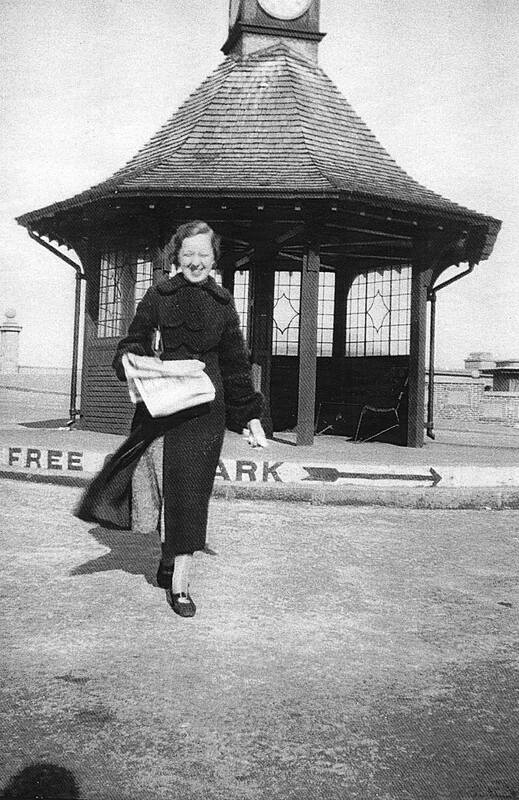 Great piece on the history of the clock shelter, with some really evocative photos. I particularly like the colour photo supplied by Dave Hutchinson, entitled ‘Cleveleys promenade and clock shelter in the 1950’s’. I do, however, contest the date of this photo. 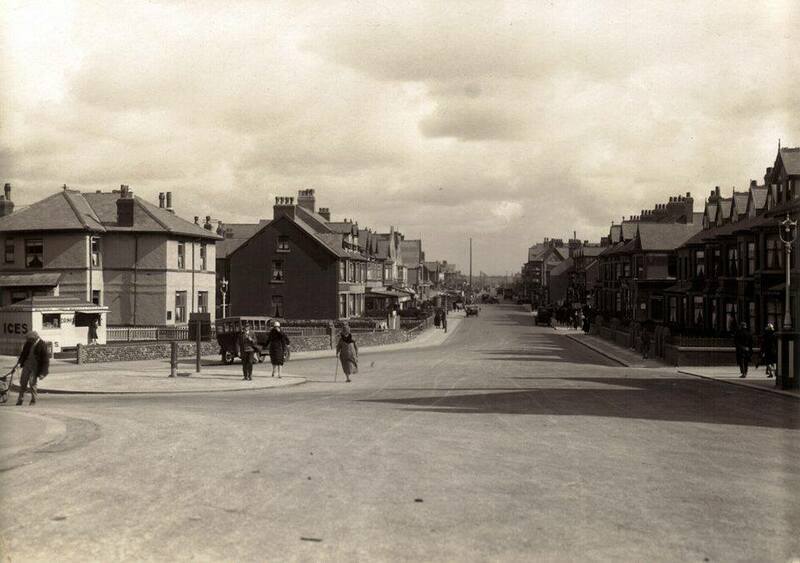 The photo comes from a postcard in the Colourmaster series, published by Photo Precision Limited, St Ives, Huntingdon, reference no PT19333, described as ‘Victoria Road, Cleveleys’. Whilst most of the cars do appear to be models produced from the mid-1950’s to mid-1960’s, my reasons for doubting that this is a 1950’s scene are twofold: Firstly, on close inspection, you will note double yellow lines painted along the edge of the road. According to Wikipedia, double yellow lines were first introduced in the UK by section 51 of the Road Traffic Act 1960. Secondly, you will note merry-go-round and candy floss booth in ‘the area known as ‘Children’s Corner’ in the foreground. however, in the ‘Our History’ section of the Masons Amusements website, it is stated that Masons took The Arena off the council’s hands in 1966 to establish Childrens Corner on the site. This then suggests the scene is more mid -1960’s than 1950’s!! Can anyone add to this? 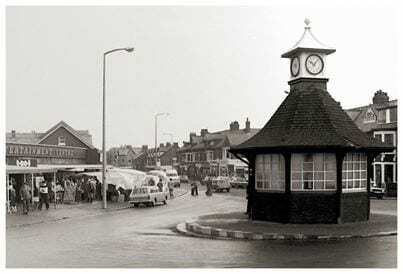 Further to my recent comment, regarding the photo of the clock shelter with ‘Childrens Corner’ in the foreground; whilst Masons Amusements website states that Masons took over the Arena in 1966 from the council to establish Childrens Corner on the site, I have seen it elsewhere on the internet (i.e. 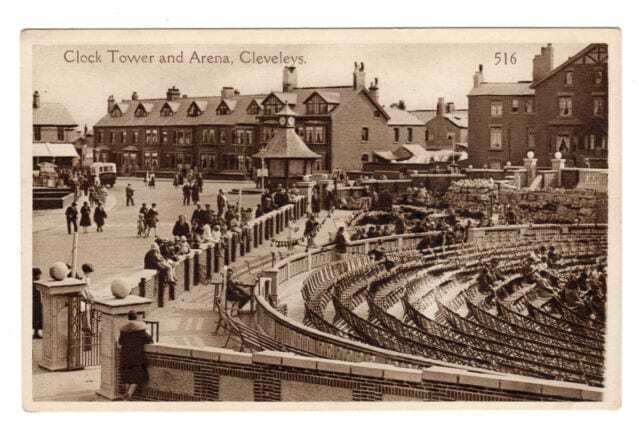 tripadvisor) that there has been a Kiddies Corner on the promenade at Cleveleys since 1961. and from my own early memories, i tend to favour the 1961 date rather than 1966. Can anyone confirm this? I wonder if 1966 was when Masons changed the previous kiddies’ car ride (with cars that I remember as being similar to ones at Corrigans in Fleetwood) to the well-known ‘vintage cars’, that remained an attraction at Kiddies Corner aka Childrens Corner aka The Arena for several decades, as well as the ‘Alpine Glide’ (helter skelter) ! !